UNLV forward Shakur Juiston was asked his feelings after the Runnin’ Rebels took Arizona, a team many prognosticators predicted would go to the Final Four, to overtime before losing 91-88 Saturday night at a raucous Thomas & Mack Center. “Honestly, I believe we’re a Final Four team,” Juiston replied. For much of Saturday night’s game, UNLV (6-2) outplayed the Wildcats (5-3), who were minus a key piece in injured combo guard Rawle Alkins, a potential NBA first round pick recovering from a broken foot. But in the end the one-two punch of Deandre Ayton and Alonzo Trier was too much for UNLV which lost in overtime for the second time in four nights to a team that will likely be playing in the NCAA tournament come March. Trier (29) and Ayton (28), a likely top-three pick in next summer’s NBA Draft, combined for 57 points, 15 rebounds and five blocks and took turns scoring Arizona’s final 21 points in regulation and OT. Shakur (21 points, nine rebounds, four blocks) and freshman center Brandon McCoy (33 points, 10 rebounds) also formed a dynamic duo in the contest for UNLV, which led by as many as 13 points early in the second half and led for over 30 minutes of the game. But much like Wednesday night’s 77-68 overtime defeat at Northern Iowa, Runnin’ Rebel guards struggled at key times. Senior Jovan Mooring, coming off a dreadful 3-for-17 shooting performance at Northern Iowa, finished with eight points on 2-of-8 shooting and had a chance to win it in regulation. But with the game tied, 78-78, and the ball in his hands, he elected to fire up a wild, off-balanced 3-point try that missed badly instead of driving to the basket. Mooring, point guard Jordan Johnson (eight points, nine assists, four turnovers) and Kris Clyburn (eight points) combined to go 5-for-21 from the floor. Meanwhile, Arizona’s backcourt of Trier, Brandon Randolph (eight points, two key 3-pointers to start second half comeback) and point guard Parker Jackson-Cartwright (12 points) combined to go 18-of-32 from the field and had just a combined five turnovers. 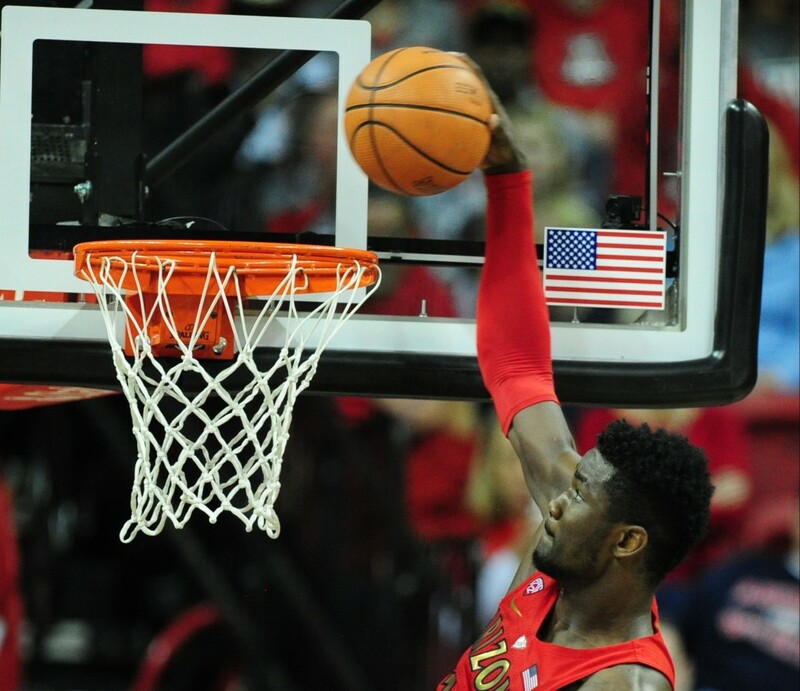 Deandre Ayton scored the final eight points in regulation for Arizona and scored 13 of the Wildcats’ final 21 points down the stretch, including a free throw with 35.4 seconds left that gave Arizona the lead for good. The 7-foot freshman forward, in the conversation for the No. 1 pick for next June’s NBA Draft who has drawn comparisons to Kevin Garnett, also caused havoc defensively with three blocks and grabbed a team-high 10 rebounds. “Honestly, I believe were a Final Four team.” – UNLV forward Shakur Juiston. “I put the ball in his hand for a reason. In that particular case, it just didn’t work to our advantage. I know he’s in pain right now. … He’ll be fine.” – UNLV coach Marvin Menzies on guard Jovan Mooring, who missed the final 3-point shot in regulation and is 5-of-25 from floor in last two games. UP NEXT: With the National Finals Rodeo taking over the Thomas & Mack Center, the Runnin’ Rebels will move over to the MGM Grand Arena for their next two games starting Tuesday night at 7 p.m. against Oral Roberts (2-7). NOTABLE: The game featured 10 ties and nine lead changes. … Johnson finished with nine assists, the fourth time this season he has had at least that many in a game this season. … The Rebels shot 53.2 percent from the floor (33-of-62), the sixth time in eight games this season that UNLV has shot better than 50 percent. … UNLV shot a season-worst 23.1 percent (3-of-13) from 3-point range. … The Rebels finished with 18 turnovers and have turned the ball over 38 times in their last two games. … McCoy’s 33 points were the most by a player in a game for the Rebels this season. … Arizona finished with a 7-4 edge in fast break points.